We offer a suite of Lominger Executive Workshops to ensure your organisation realises the maximum benefit from the Leadership Architect framework. In our years of working alongside organisations using Lominger as a framework for leadership and management development, we have identified some recurring gaps across executive teams, or in the development of potential Execs. 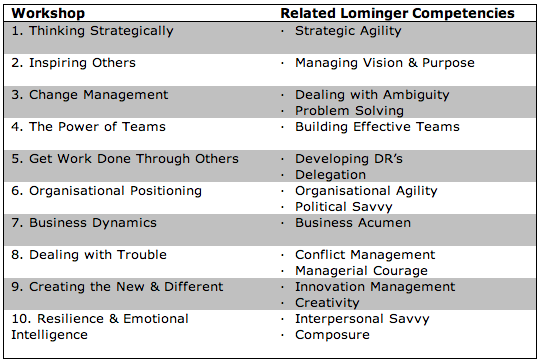 This suite of workshops closely align with the Lominger Eight Competencies most correlated with executive effectiveness. Thus we have designed a range of workshops that may be appropriate for your senior leaders and/or Hi Potential Managers. Each workshop is designed to support individual coaching and other feedback sessions. These half-day workshops include relevant pre-reading, self assessment, discussion and case studies. The emphasis is on practical on-the-job application, giving participants the tools and approaches to apply the Competency areas in which they’d like to become more effective. Workshops can be booked to run monthly. We recommend organisations select the 6-10 workshops that best match any gaps identified in your Lominger group profile or in capability shortcomings of Hi Potentials. We can assist to identify the workshops that will provide you with the best return. Contact us today to find out how these workshops can benefit your organisation.